THOUSANDS of red and blue soldiers will sprawl across the walls inside IWM North this August as part of a constantly-evolving live artwork marking the First World War Centenary. RedBlueRedBlue, by artist Mark Anstee, marks the centenary of the conflict and challenges visitors to think more deeply about the First World War. 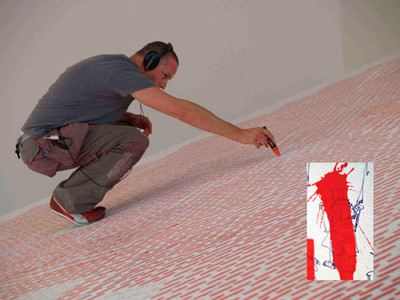 For one hour each day from 2 to 31 August, don’t miss your chance to see the artist working in the heart of the museum using the opposing colours of red and blue – symbolising warring factions – to draw thousands of Army action figures. As he draws, the figures will be projected live onto the walls of the museum’s main exhibition space creating a giant kaleidoscope of red and blue. Follow a virtual battle as each force tries to out-manoeuvre the other. Anstee hopes the work will inspire visitors to think in new and different ways about the First World War, and to question the persistent, recurring nature of conflict itself. He said: “Opposing colours have been used to denote warring factions in conflict for centuries. Even at school we were given a red or a blue bib to divide us into teams; some days you were red, some days you were blue. Can’t make it to Manchester? Why not catch a live stream of the artwork via IWM North’s YouTube channel.